WASHINGTON—The 31st Comptroller of the Currency Joseph M. Otting hosted former Comptrollers and former Acting Comptrollers as the Office of the Comptroller of the Currency (OCC) begins its 156th year overseeing the federal banking system. The former agency leaders joined Comptroller Otting for lunch to discuss the future of the agency and the federal banking system. Pictured from left to right are Robert L. Clarke (1985-1992), John D. "Jerry" Hawke Jr. (1998-2004), James E. Smith (1973-1976), John C. Dugan (2005-2010), Joseph M. Otting (2017-present), Keith A. Noreika (Acting May 2017-November 2017), Julie L. Williams (Acting April 1998-December 1998 and October 2004-August 2005), John G. Walsh (Acting August 2010-April 2012), Eugene A. Ludwig (1993-1998), Thomas J. Curry (2012-2017). The gathering of distinguished bipartisan leaders on January 31, 2018, reflects the progress of the modern banking industry, the value of the agency’s independence, and the richness of its heritage. 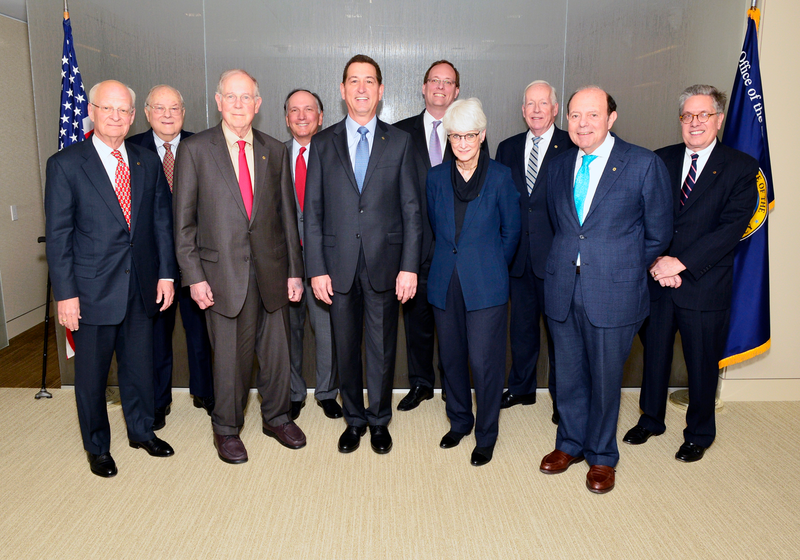 I was proud to host former Comptrollers of the Currency and former Acting Comptrollers, as the OCC begins its 156th year of ensuring our nation has a stable, functioning banking system that supports its economy and serves consumers, businesses, and communities across the country. Created as a bureau of the U.S. Department of the Treasury by the National Currency Act of February 25, 1863, the Office of the Comptroller of the Currency marks its 155th anniversary in 2018. Surviving Comptrollers who were unable to attend and are not pictured include John G. Heimann (1977-1981) and C. Todd Conover (1981-1985).